Tips to the guide, driver. Departure 13:30 behind Alexander Nevski Cathedral. 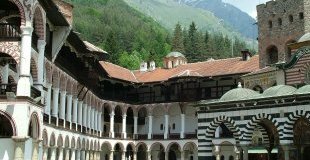 Rila Monastery is the most exquisite example of monastery art and architecture of Bulgaria located in the picturesque heart of the mountain. The Church of the Nativity of the Virgin Mary keeps the miraculous icon, splendid gilded iconostasis and the chest with relics of St Ivan Rilski. In the court are located the middle age battle Hrelyu tower and the kitchen. 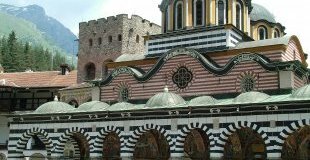 During your free time you will be able to visit the church museum with the wood-carved cross of monk Rafael or taste the famous local mekitsi (kind of a donut) and the traditional Bulgarian yogurt. Child 5 - 15 yrs. and students 18 - 25 yrs.